To compute the AQI (typically cited from the PM2.5 #) a formula is used. See the wiki page above. So we have a sensor, we already have a Bluepill running Ada with an SPI screen to display the results. The sensor is a $20 eBay purchase. Bluepills are < $2 as documented on this blog, screen is a little over $3. 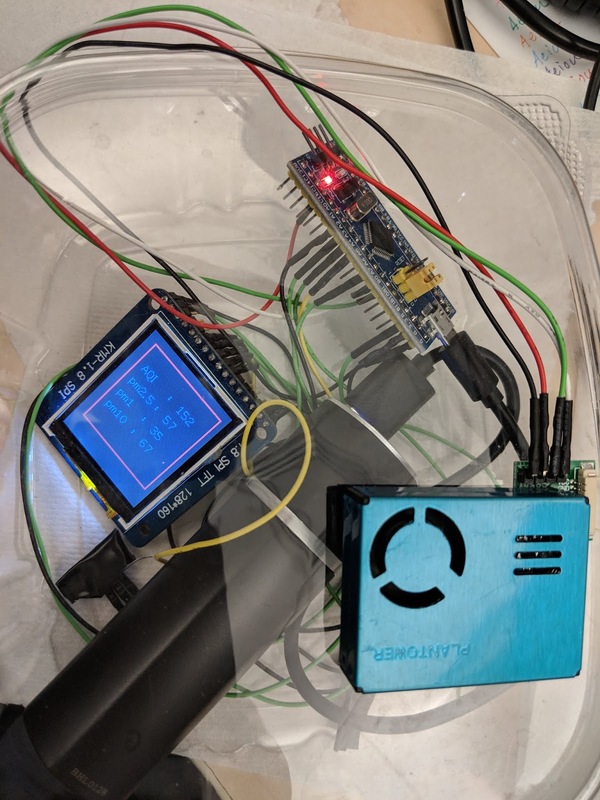 So for $25 or so you can build your own AQI meter. If your like me... a FW engineer attempting to do soldering then this might sound familiar. I have been replacing Bluepill STM32F103C8's with STM32L443CC chips. Its a hack as I do it as I use hot air for the remove and then residual pad solder for the stick down of the replacement. Not surprisingly, some pads don't get good adhesion. Worse, some pads don't show this lack of adhesion until much later when you need the pad to do something useful. The STM32 series are quite good, I think all user pads can be made into GPIOs. What if we wrote a program that toggled each pad every second and then walked the pins with a meter. So that program was written. & concatenates items together, in this case of GPIO_Point making the init of the array BP_Points. The lib has code to accept the array and it will walk each element and toggle each one. So that is every useful pin on a Bluepill highlighted above in the decl. With the abstraction of the pins to be a single element, initialization and group change becomes trivial and a small amount of user code. A corridor conversation with a co-worker, Tyson Leistiko followed. As I described my software he mentioned I should group the GPIOs in such a way that neighboring pins toggle asymmetrically and in that way look for non 3v, 0v pins indicating some form of pin bridging. So pinny was adapted easily to add two hand picked sets that reflect the property of being neighbors to the other set. Then both pinny programs go into a loop allowing you to probe all the pins for the 3v -> 0v -> 3v .. pattern. 1) Trace can be enabled out to a pin on the board (PB3). 2) 32 channels can be used to emit 32, 16 or 8bit (char) values from running code. Useful to monitor values from your code. 4) Data Watchpoints can also be reported. See a picture below. Showing a watchpoint on the read modify write of the Green LED on PC13 (HW watchpoint on: BSRR @0x40011010). Also an Overflow is seen (first time I have seen that actually). Can be mitigated by bumping the output rate. Bluepill shown with a VL53L10X range sensor. 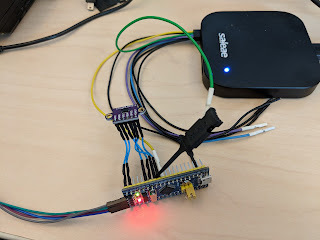 The trace is the yellow wire connected to TRACESWO PB3 and green wire is connected to GPIO1 from the sensor. That is plumbed up to go low when a new sample is ready. Based on the range value, the green LED is lit or not. (a version of this is used in my garage to detect if the car is far enough along to close the door w/o striking the rear or the vehicle). So a board that can cost $1.27 on Taobao has all this and more. One omission on such an inexpensive design is ETM (Embedded Trace Macrocell). This is featured on many of the larger ST designs. Its easy to check if it exists as the register space at E0041000 will have non-zero contents. On a bluepill, that space is all zero. No matter, Instruction Trace Macrocell (ITM) is available. This can report the PC of the running program at a sub-sampled rated. ITM also reports when the code dips into the exception handler as shown above. Usually though when configured, the diet is a steady stream of PC's. Some observations of this technology. 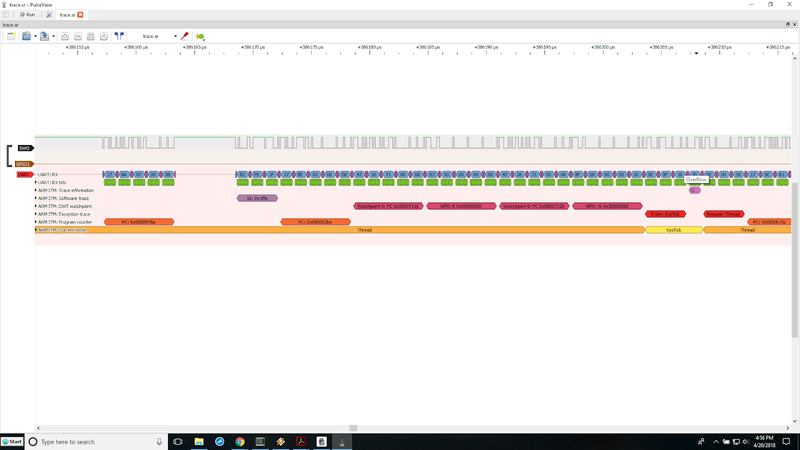 b) Adding .py scripts to Pulseview to permit GUI viewing of trace output as seen above in the images. 2) ETM, Petteri used an F1 Value Line part per his blog. I had no luck getting ETM data out of that part. 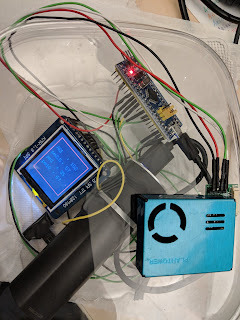 Some observations:1) You must have a debug connection to the target to get SWO to emit trace. 2) It's possible to muck around with rate settings. You can get a rate that is unreal, I had a Bluepill+ with trace @80Mhz coupled with a minimally subdivided PC. You get a firehose of PCs coming out. Perhaps one very 20-30instrs or so. Amazing. 3) My code is a translation of Petteri's C example into Ada. So once in Pulseview we can add a decoder to the UART. Just add ARM ITM and set the baudrate to your capture speed (in my case, 8Mhz). Then let Pulseview's decoder show you the trace. Following up from the work I did on getting Ada going on a Bluepill. Is a Bluepill a fixed entity? Looking at the SoC the Bluepill uses we see it is a Cortex-M3 running at 72Mhz with 128k of flash and 20k of ram. There are newer STM32 chips all the way out to Cortex-M7's. I have this tool from ST called the ST MCUFinder. You can screen all their parts by different parameters. I had already hacked Ada onto the STM32L432 for the Make-with-Ada contest last year so the L series was still quite fresh in my mind. 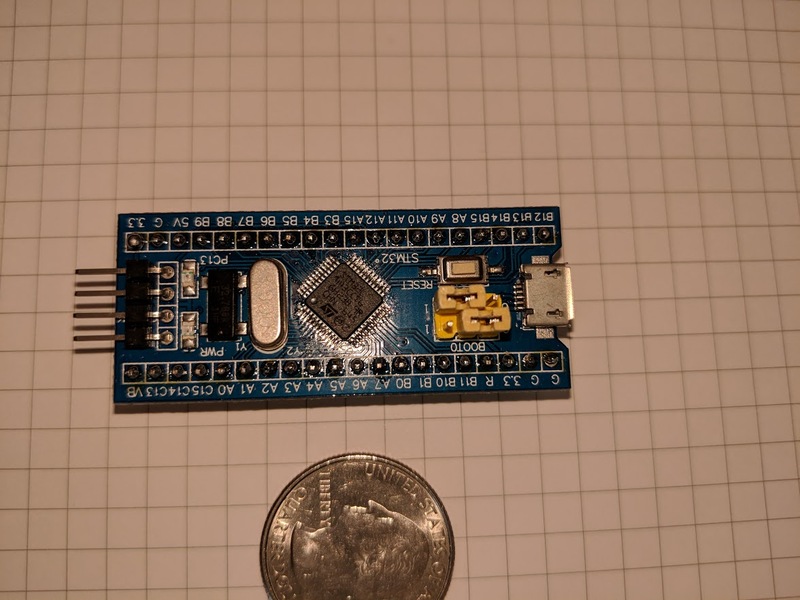 So looking at the package the STM32F103C8 on a stock bluepill was there a newer, pin compatible, STM32 cpu across the family that could drop in and work in place of the original? I will spare dear reader the suspense, indeed there are a bunch of parts that have the same footprint. That part uses a Cortex-M4F, runs at 80Mhz with 256k of flash and 64k of ram. Plus it has more peripherals than the STM32F103C8. This 443CC has 2 12 bit DACs. I like 2 DACs since you can make oscilloscope vectors with that HW. Anyway, the donor CPU an STM32L443CCT6 is about $2.61 in 10,000 unit qty. For me buying 5 or so was about $5 to $6 each so really a Bluepill+ costs about 8$ after surgery. Even at $8 this board is pretty good for what you get. A $2 bluepill board was sacrificed to be a donor for Bluepill+ updating. Basically, since the parts are pin compatible you need only use a cheap hot air station (these are sub $100 on eBay) and some tweezers. Get a helper to spread the hot air and gently tweeze the package away from the board as the solder liquefies. I had also tin foiled the rest of the board to avoid stray heat. Once off the board, the donor IC is placed on the footprint (carefully!) and then using an iron, tack down the legs to the liberated pads. The residual solder is enough to make good contact I found even after cleaning the pads up a little bit post removal. One technique I found helpful in my Ada port was that ST via its CubeMX and free SW dev tools has lots of examples. If you get stuck with some IP thats not working in Ada. Build a CubeMX example that initializes or uses the IP you need to port. Once thats up and running on your board, use the Ruby scripts I mentioned to dump the ST example codes reg settings. First you can use that as a reference, and later use logs2dump and diff your port to the example code. Where there are diffs might expain why your port is not working. Openocd 0.10.0 needed some minor mods to get attached to the bluepill+ Basically, the flash code needed to be told about the STM32L443's flash size based on the unknown part number. Also the target script needed some changes. I will add more to this entry later about this.